One thing I have not mentioned so far is that WA is way ahead when it comes to mobile networks. The major interstate hwys have very good mobile coverage (not complete, but close) around the whole state. They have obviously taken a much better approach than QLD and NT, who have very limited coverage and are still stuck with those UHF radio repeater towers in remote areas!! It is mostly Telstra only of course (until you get to the populated areas), but that’s a lot better than nothing! I was however surprised that the main interstate hwy in the north of the state (going into NT) actually go down to just one lane in quite a few bridge crossings (10 or more!). I don’t mean one lane each way, but one lane altogether! 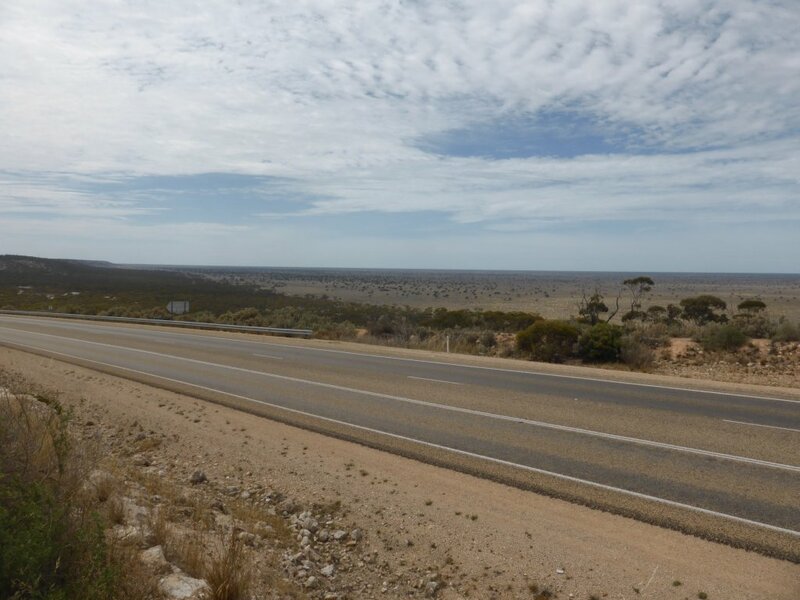 Traffic density is rather low, so perhaps that justifies it – there is a lot more traffic heading across the Nullarbor to SA than across the top into NT. Out in the Nullarbor area, where we’ve just gone through, there are of course no issues free camping. Many places along the way where you can just pull over for the night. It’s expected/normal. It was a bit of a surprise to come across the actual Nullarbor Plain. I though we’d already done a thousand km’s or so of boringness. 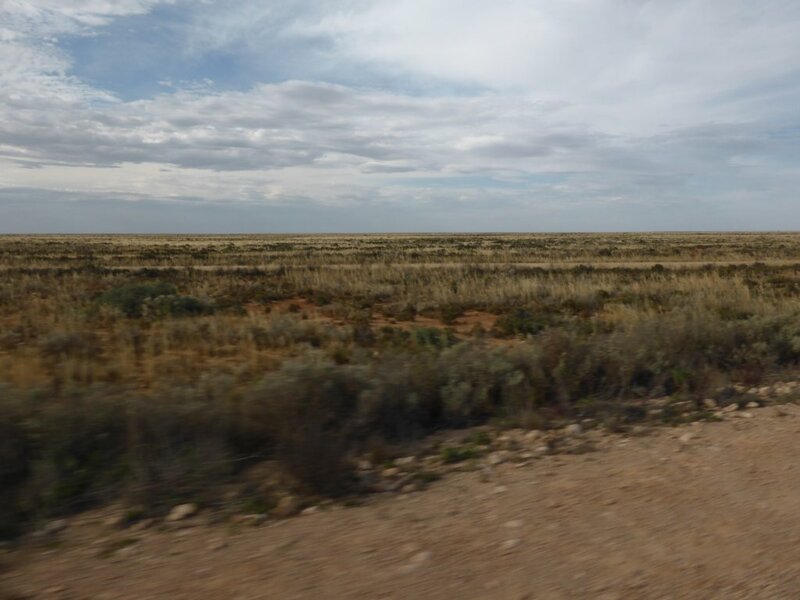 I gather the actual meaning of Nullarbor is a ‘treeless plain’, as that’s what one of the signs indicated, and yes, there is a big plain with no trees (just low shrubs) in one place. However, I’ll stick with the null meaning nothing, and the bor meaning boring, cause then I can apply it to the two thousand km’s across the Great Australian Bight that are pretty boring and mostly featureless! We are currently adjusting the time, forward 2.5 hours from what we’ve been using since entering WA. Bit of a pain in this direction, as it means getting used to going to bed and waking up earlier – much easier the other direction (one days sleep-in!)! Heck, 2.5 hours is more than I had to adjust for on work trips to China, Vietnam and Malaysia! I’d better quit the winging on this now though, as I’m sure some readers travel more widely and they’ll be calling us sooks! The motorhome is going well, but still has that turn-off delay issue (Ford in Perth reckoned nothing wrong, but I don’t think they tried hard…or at all…). Doesn’t really cause any problems though, except the orange engine light comes on in the dash after a few delayed engine shutdowns (engine keeps running for a minute or two after you take the key out). Nic and I are sharing the driving, so that’s good, and she even had to overtake a greatly oversized truck carrying a full Dump Truck (7.4 metres wide I think they are) heading into Kalgoorlie! 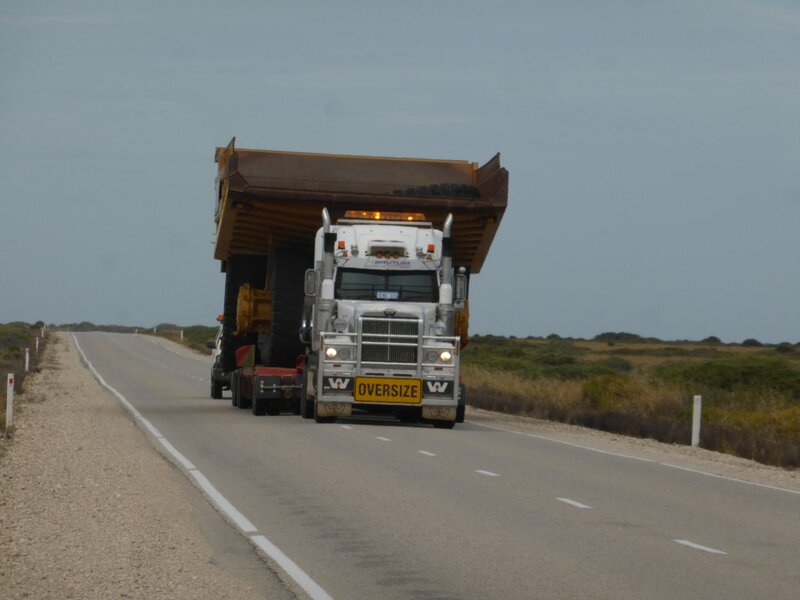 on the nullarbor (not the one Nic had to overtake, but similar). Seems Kalgoorlie gets its dump trucks transported across from Adelaide! We’ve been driving a little slower, to see how fuel consumption responds. Seems it is heavily dependent on speed with usage dropping to around 13-14L/100km when sitting around 90km/hr (compared to 15-16L/100km at 100-105km/hr). However, I’ve also picked up that if the orange engine warning light is on, we get worse fuel economy (16L/100km even at 90km/hr). The orange light is due to the engine turn-off issue (mentioned above), but goes away after a few correct shut-downs. So we need to let the engine idle for a little after lots of driving, so it turns off correctly all the time. Probably a good thing to do anyway – let the turbo cool down etc. But anyway, with speed affecting fuel consumption as much as this, it looks like we’ll be driving for slightly longer to get back to Brissy! Daniel has finished his maths book for the year, so that gave Jonathan some impetus and he spent the first day of the Nullarbor flat out doing maths the whole time! Good time to do it I guess – not much else to look at! Oh, and we got a bill from St Johns Ambulance, for taking Jonathan to hospital after the snake bite! Didn’t realise that still happens in Aus (no fees in QLD – well, they are added to every electricity bill)! How’s $734 sound? Wasn’t told there would be fees at any stage, and I didn’t actually request an ambulance – I phoned to talk about options and what we should do, as we were always somewhat skeptical as to whether he was in danger. Didn’t get anywhere with that though – their automatic assumption from the start of the call (literally) was that an ambulance was required ASAP. Fortunately it doesn’t matter, as the cover we all get in QLD covers us when interstate too – they’ll pay it for us! Phew! So we are in SA now, working out what there is to see and do. After being in WA it seems like a small state with just a few tourist things to look at, but I’m sure there is more to it than that! We’re open to suggested places/activities!! 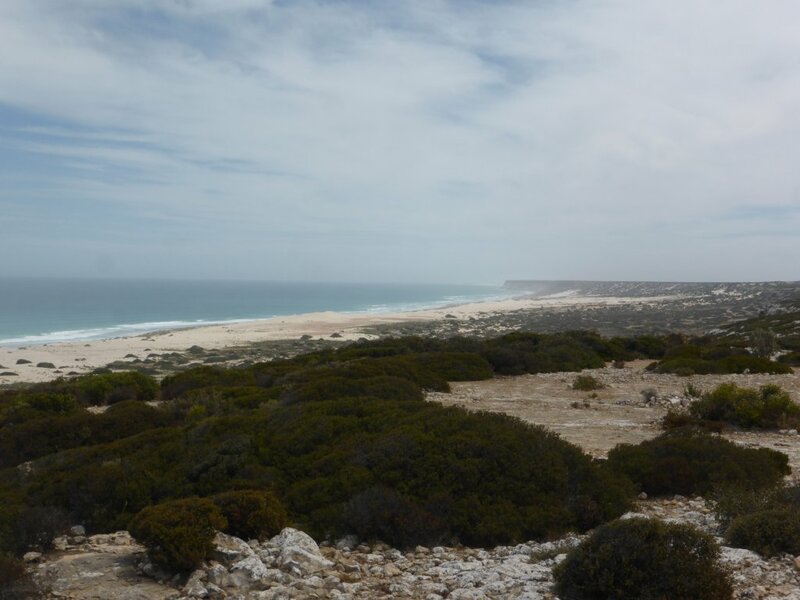 Today (Thur 30/10/2014) we started heading down the coastline of the Eyre Peninsula (spending the night at Smokey Bay), so will see what we find there! This entry was posted in People, Places, Planning by Simon. Bookmark the permalink.